You will find several articles online which will tell you how to earn money online, but in real none of them are legit. So today in this article I will provide you a legit method with which you can easily earn online in a long run if you are ready to dedicate your time and hard work. There are two options available to earn money online with Dailymotion they are Website Monetization and Video Monetization. Dailymotion Video Monetization program is for those who can create creative videos, but it should be your own work. Earning money from Dailymotion doesn’t means you download others videos and upload it over Dailymotion to earn money that is against the policy and you can’t earn money from others videos of which you don’t fully own the rights and doing this can lead to suspension of account as well as legal action. If you are good in creating videos than you can easily earn with Dailymotion, this program is similar like YouTube Creator Program where ads are displayed on your videos and once the video viewer clicks on the ad you get some percentage commission. You upload videos over the platform, monetize it, and get views on your video and once you reach the payment trash hold you get paid. 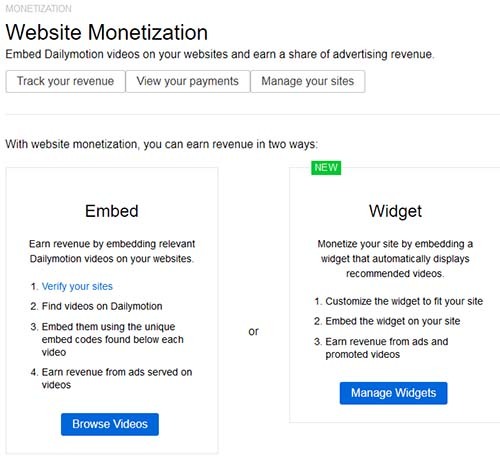 Dailymotion Website Monetization is for website owners or webmaster, here you can earn money online with Dailymotion by embedding videos from Dailymotion on your website and earn a share of advertising revenue. So now let’s know how to become Dailymotion Video Monetization Partner or Dailymotion Website Monetization Partner. Visit Dailymotion by clicking here, and register an account. Once you are done with registering an account, login into your account and go to settings page. 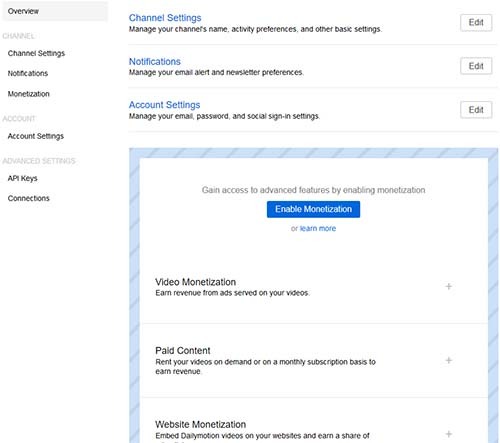 On settings page you will see enable monetization, so to activate monetization feature or become partner just click on enable monetization. A popup will appear enable monetization and become a partner, just accept the Dailymotion Partner Terms & Conditions by checking the box and click on I agree button. Now you have become partner and can now earn money by uploading videos via video monetization and by embedding videos on your website via website monetization. To earn money by video monetization you will have to upload your videos and once you get views on your videos you will be able to track your revenue generated from your videos. To earn money from website monetization in settings just click on website monetization > manage your sites > add a site and add your domain and click on next button. On next page to verify your domain you will have to verify the domain by meta tag, by uploading html file, or txt record or cname record. Once you get your domain verified you can generate widgets or embed relevant Dailymotion videos on your websites. 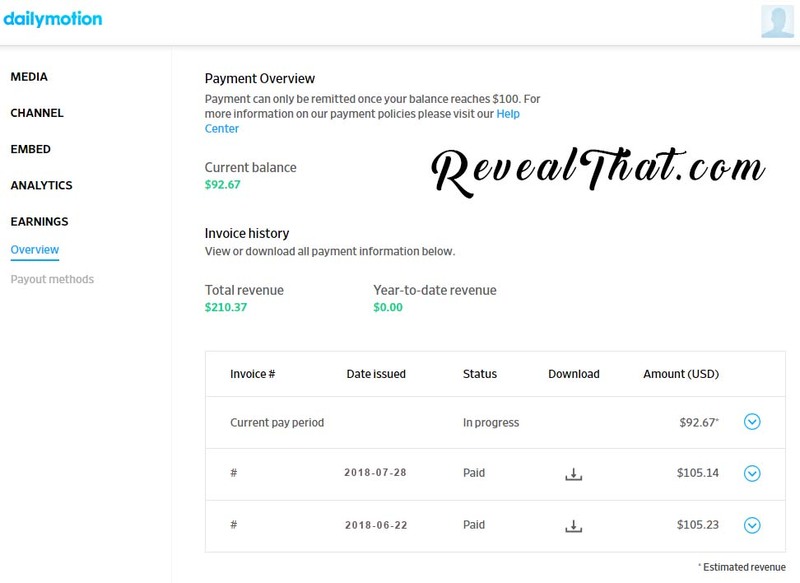 So when someone videos video on your website you will automatically earn revenue. Once you are done setting up everything don’t forget to fill in the banking information in banking info tab, so that whatever earned revenue will get automatically transferred to your bank account or PayPal account every month once the balance reaches the trash hold. That’s it this is how you can easily Earn Money Online with Dailymotion. Below we have attached few payment proof of Dailymotion Partner Program, which will motivate you at some extend.